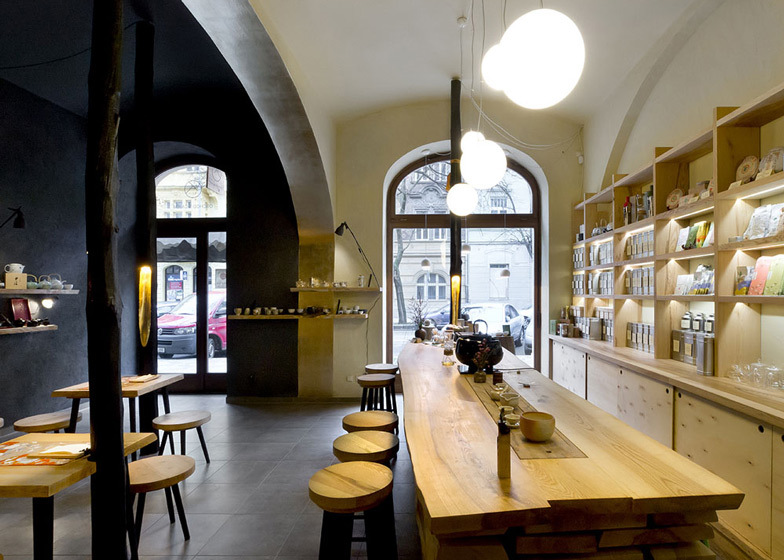 Czech studio A1 Architects covered the walls of this cafe in Prague with a tactile mixture of black plaster, coal and pieces of straw, in a modern take on the clay plasters used inside traditional Japanese tea houses (+ slideshow). A1 Architects converted a nineteenth-century apartment with vaulted ceilings to create the Tea Mountain cafe, reinforcing the concept of a Japanese tea house by filling the space with charred log columns, each with an illuminated gilt section in its middle. "We've already designed three tea houses and we are very much inspired and fascinated by Japanese architecture and its details," architect Lenka Kremenova told Dezeen. "We used even pieces of coal to emphasise the blackness so it feels like you want to touch not just look at the plaster," she added, referring to the walls. "We always search for a certain kind of quality of materials which could be called 'touchableness'." A gold-plated arch divides the tea house into two halves, creating a light side for service and a dark side for sitting down with a drink. The first is painted in a shade of pale yellow, and accommodates a serving counter and wooden shelves stacked with tea. The opposite side features dark plastered walls and is filled with tables and stools made from ash wood. 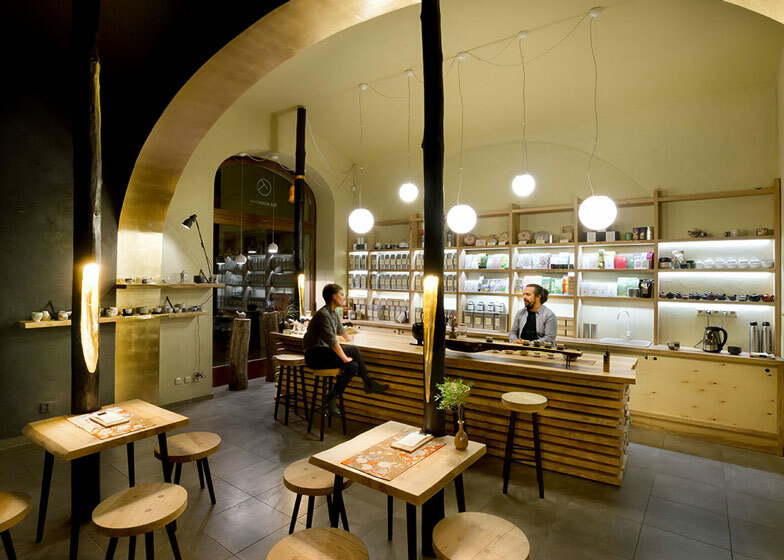 "The seating is in the black part because it is supposed to be a more calm and relaxed place with an ambient atmosphere to enjoy drinking the tea," Kremenova explained. A row of globe lights are suspended at different levels above the serving counter, while wooden shelving around the edges of the shop are covered with teapots and other tea-related paraphernalia. The shop sells a range of tea imported from Japan, South Korea, India, Taiwan and China. 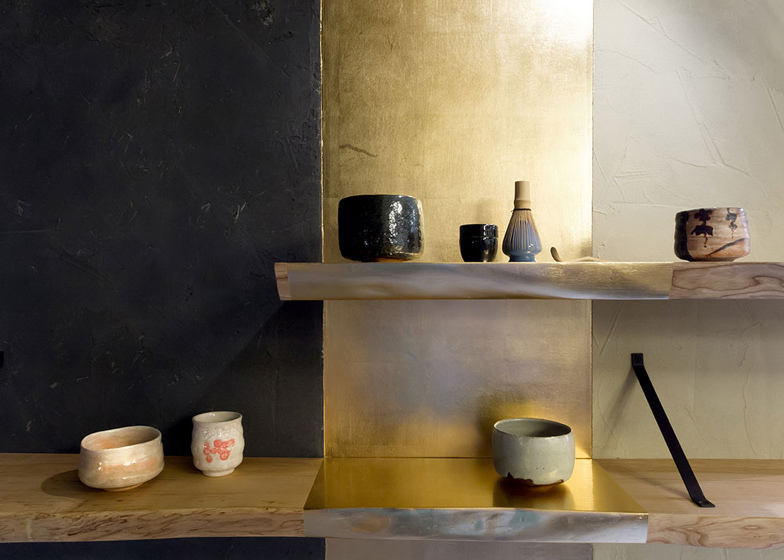 The shop called Tea Mountain, recently opened in Prague, brings a new experience how to enjoy the tea, next to contemporary style of serving it is also traditional gustation of high quality tea imported from Japan, South Korea, India, Taiwan or China. One of the main issues of a1architects and the owners discussion was how to present the tea in its best to wider audience in a delicate yet friendly manner. Two worlds, two atmospheres... The seating and drinking happens under the dark vault with its calm appearance and just next to it in bright earthy colours one could buy or watch the presentation of tea. The space of two original 19th century vaults is divided by gold-plated arch line situated almost in the centre of the shop. The black plaster with added pieces of coal and straw creates an ambient atmosphere and it gets out the customer in his first step into another atmosphere out of the busy street. The following part of the shop is rather light to unable one to focus on details of the tea presentation. The seating at the table in the black part is accompanied with charred columns with inbuilt gilt cavity which serves as a spot light and brings beautiful warm yellow light on the table. The counter and display shelves are made out of ash wood with exceptional details like inbuilt limestone tea tray, rope handles or charred cover of the scale, all these small unique pieces could be rather seen in a second glance and await patient visitors. Refined details and simple work of layering are the main features of the Tea Mountain shop design.